Tangent launches Prestige floorstanding speakers | What Hi-Fi? 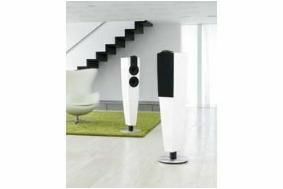 Set to retail for around £1800, the Tangent Prestige speakers are certainly easy on the eye for two big chunks of speaker. The vertical 2½-way bass reflex construction features a tweeter described as one of the world's best: the Scan Speak Illuminator D3004. Featuring the unique Air Circ Magnet system and Large Roll Surround (LRS) technology, the tweeter is paired with two mixed fibre cone woofers. Available now, the Tangent Prestige is on sale for just under the £2000 mark.